Digital marketing entrepreneur Hafiz Muhammad Ali's launched a new book "Digital Passport: Your Pass to a Promising Career in Digital Marketing" on Amazon. I know what it’s like to struggle in the digital marketing industry. For years, I had to go at it alone. I wrote a book for people who want to build a career in the digital marketing industry like I have. This book provides a guide for people starting a new career in online or internet-based marketing. The book joins Hafiz's other career development resources including "Digital Ladder" which is the world's first psychometric assessment to help aspiring marketers find the right digital marketing specialization. "Digital Ladder" includes a series of questions about the user's personality, preferences, and natural tendencies. This information provides insight into which digital marketing specializations may be a good fit for the user. "Digital Passport" takes Ali's marketing career guidance resources one step further by providing practical insights and a roadmap on how to get started. Hafiz shares insight gained from over eight years in marketing. He learned the industry from the ground up, through trial and error. He hopes to ease the path for new marketing professionals who can benefit from his experience and insights. Digital Passport provides insider insights on how to launch a successful and prosperous career in internet marketing. This book will be perfect for those who are looking for a career in Digital marketing which offers growth, challenge, and opportunity whether you have a creative soul or an analytical mind. Ali is a serial entrepreneur, digital marketing career and leadership coach and published author. He created the online marketing industry's industry’s first Digital Marketing - Career Assessment Test "Digital Ladder." Ali founded Omnicore Group and is a contributor at Entrepreneur.com. He loves investing in books and education to help aspiring students thrive in digital marketing. His own educational background includes He an “MSc. In Digital Marketing Leadership” from the University of Aberdeen and a “Life Coaching” certification from the University of Cambridge. Ali has been featured in: Yahoo, Forbes, Inc., Entrepreneur, LifeHacker, Business Insider, AdWeek, Huffington Post, AllBusiness, MarketingProfs and more. Visit Hafiz Muhammad Ali's website for more details about the author. "I also highly value giving back and helping others succeed, which is why I’ve spent so much of my time and effort mentoring others," said Ali, "I’ve always been independent and digital marketing is the best industry for me to remain independent, become successful, and help others at the same time." "Digital Passport" offers a practical overview of online marketing that helps anyone entering a digital marketing specialization whether the reader is a recent graduate or a mid-career professional seeking a change. 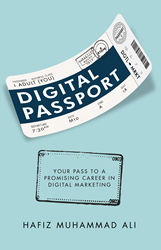 "Digital Passport: Your Pass to a Promising Career in Digital Marketing" is available on Amazon.com and Amazon.co.uk.